We were impressed with Sagely Naturals Relief And Recovery Cream, a high-quality, effective CBD topical salve. The first thing we noticed after unboxing this CBD cream was the quality of the bottle itself. Sometimes companies try to cut costs by offering low quality packaging, but that wasn’t the case with Sagely Naturals. The bottle was solid and the pump was responsive, providing small or large quantities of the cream with ease. Sagely Naturals Relief And Recovery Cream is non-greasy and light. We liked that it felt like regular lotion, not a pain relief cream. The subtle peppermint and menthol scent reminded us that pain relief was on the way! With a member of our review team struggling with lower back pain, we knew Sagely Naturals’ CBD would be put to the test. Relief and Recovery Cream is easily massaged into the skin, and quickly begins both cooling and warming the affected area. The heat level increased gradually, peaking after about 15 or 20 minutes, but remained at a pleasant level for hours afterwards. After applying twice, pain levels seemed to have decreased noticeably the next day. 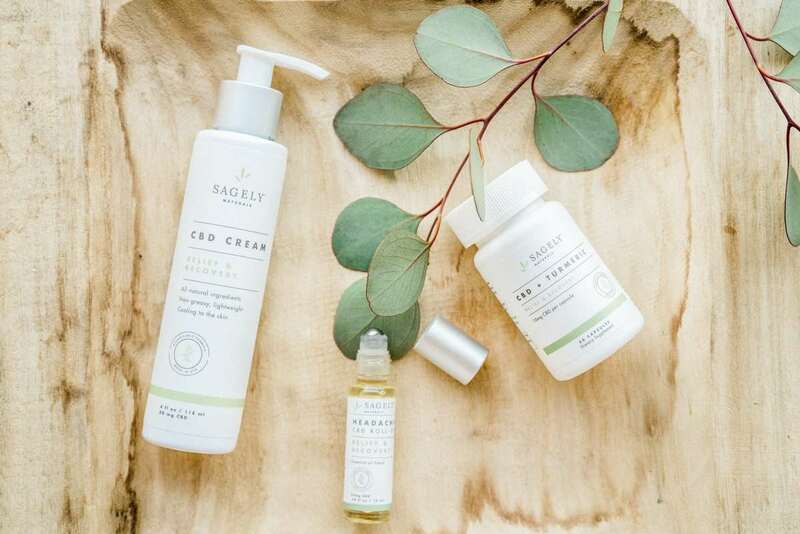 Sagely Naturals Relief and Recovery collection includes a topical CBD cream, a headache roll-on, and CBD capsules with turmeric. Sagely Naturals paid us a fee and offered us free products in return for our honest opinion. If you purchase a product from one of these links, we’ll receive a percentage of sales. We only select the highest-quality CBD products for review on our site. Read more about sponsored content on Ministry of Hemp. Read on for more about Sagely Naturals Relief and Recovery product line, and our complete review. Two friends, Kaley and Kerrigan, started Sagely Naturals to create a product that they both would want to use and that could treat their mothers’ everyday aches and pains. 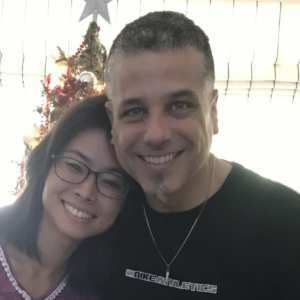 As believers of the powerful effects of CBD, they set off to create products that help people without any psychoactive effects. Sagely Naturals creates their products using organic, non-GMO hemp that adheres to strict quality control standards of operations. Every batch of CBD is triple lab tested to ensure quality and purity. Moreover, they only use essential oils and natural ingredients that are free from parabens, synthetic fragrances, artificial colors, dyes, and sulfates. While this CBD topical has a lower strength than some products on the market, the combination of top quality hemp extract with added natural healing ingredients meant that Sagely Naturals Relief and Recovery Cream was more than up to the challenge of easing muscle soreness. 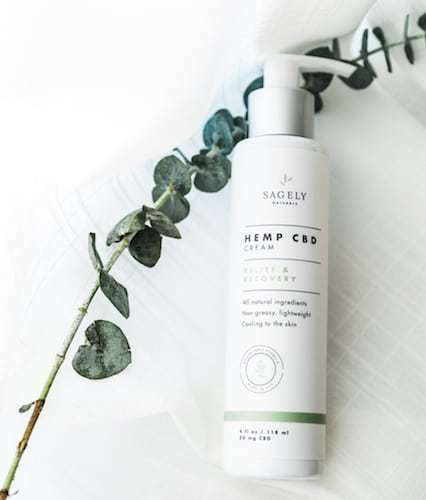 Highlights: Sagely Naturals Relief and Recovery Cream combines the cooling/warming sensations of menthol and peppermint with high quality CBD relief that effectively targeted our pain. Texture & Scent: This CBD topical has a light, lotiony texture that quickly absorbs into the skin without greasy residue. It has a mild scent of peppermint and menthol. Sagely Naturals uses only U.S.-grown, organic, non-GMO hemp in their products. Sagely Naturals Relief and Recovery Cream is part of their complete Relief and Recovery collection, including CBD capsules, oral spray, and a headache stick. Their Tranquility collection combines CBD with additional relaxing natural ingredients.